Saturday Morning Classics – Double Indemnity – 1944 | musings at random. I’ve always said that some of the best movies can be seen on a quiet Saturday morning; there’s some good fertilizer in that crisp Saturday morning air that gives blossom to great movie viewing. It’s fun to catch a great picture from start to finish in the gray of the morning before the world wakes up, and before you owe the day any of your time, or anything to anyone. Some of the best films I’ve ever seen have been scoped on mornings just like that, free of burden, free of care, and with a surplus of time. When we were kids, my sister and I made it a goal to watch as many of the American Film Institute’s Top 100 films of all time in one summer; I can’t recall just how many we saw, but we gained some good ground while she was in town. 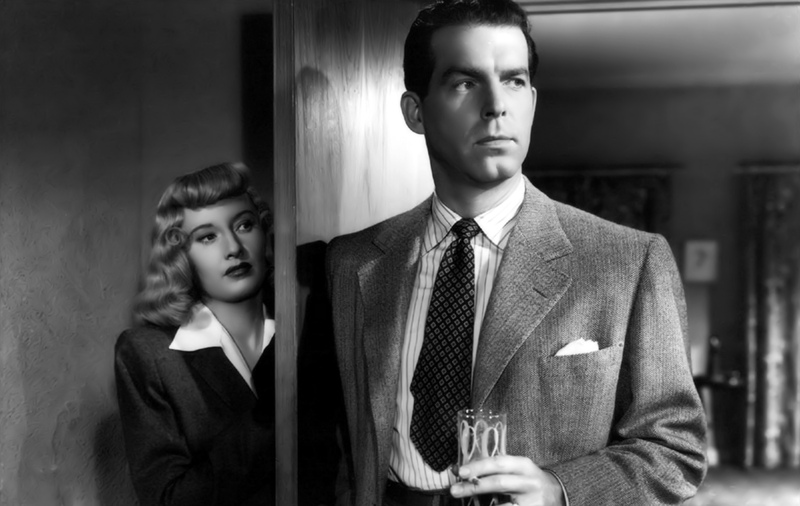 One of my favorites from that summer was 1944’s Double Indemnity, starring Fred MacMurray and Barbary Stanwyck, so I decided to give that old classic a go this morning with my coffee. Director Billy Wilder’s Double Indemnity is film noir at its finest; the dialogue was as thick and sultry as the lingering cigarette smoke, the script was as complex and detailed as the bourbon they drank, and the characters were as cool and slick and breezy as a mid May afternoon. The cinematography was a dimly lit tapestry of finely weaved shots that suffused the story with an air of gritty believability, and added a hefty and necessary dose of grim weight to the subject matter. The sturdy Fred MacMurray played Walter Neff, a hot shot top insurance salesman who fell instantly for the brazen and deceptively conniving Phyllis Dietrichson, played icily by Stanwyck. Neff falls hard for the allure of Mrs. Dietrichson, who convincingly lures the haplessly love struck Neff into a plot to knock off her husband after taking out a life insurance policy on him. The venerable Edward G. Robinson, star of a horde of gangster films and early Hollywood gems, played the feisty and meticulously detailed Barton Keyes; a remarkably intelligent Sherlock Holmes-esqe claims adjuster with a knack for sniffing out mischief. The dark and brooding undertones of the film set a castle solid foundation of deceit, mystery, and intrigue that was so effectively present in the classics of the 40’s and 50’s, and earned the film seven Oscar nominations, including Best Picture.